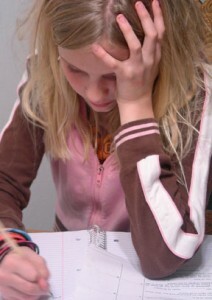 Homework seems to be a recurring problem between kids of all ages and even some adults in college. It is a constant struggle that can be a huge game changer when it comes to grades. That is why here at the The Tutoring Center in Garland TX. we have a few tips to help your child with some common homework problems. Check that homework is always written down. The biggest mistake many kids tend to make is to not write down what the homework is for all their classes. They might think they can remember or they might just forget to even write down the homework. You can help them by asking if they wrote down their homework when you pick them up for school and before they leave school grounds so that you make sure you send them back if they did not write all their homework down. If this is a problem your child faces you might want to send them a text at the end of the day to make sure they text you their homework before they leave the classroom. Make sure to get their teacher´s permission for this, since your child might not be allowed to bring out his or her cell phone. Make sure they do homework in a routine manner. Another thing that will greatly improve your child´s performance and ability to actually do his homework is to create a homework routine. Have your child do his or her homework at the same time in the same place in the same room as much as possible preferably everyday in the same way and using the same chair or desk. Our mind has to work twice as hard when it has to choose or decide whether it will do something or not and when so don't give them a choice or a variable, make it routine so that it is something they do immediately without thinking. The most ideal time to do the homework would be right after school maybe after a quick snack. Have them turn in their homework. The most frustrating part of homework problems is when your child actually spends his or her time doing the homework and working hard at it and then forgets to turn it in, or they forget when it is due and they leave it at home. This is an essential part to doing homework that many times gets overlooked. As soon as your child finishes a homework assignment make them put it in their backpack before they even put the pencil down. Placing the homework inside the backpack should be as automatic as placing their hand in a cup to hold it up to their mouth before drinking it. Practice with them putting an assignment inside their backpack everyday even if they do not have homework everyday give them a piece of paper that says homework to place in their backpack and have them put their homework assignments as soon as they are completed inside the backpack even if they are not due until a few days. You can also help by reminding them before they head out the door in the morning but this should only be done for a few days until they understand it is their responsibility to remember without being reminded. Get them help with homework. The entire purpose of homework is to make sure they practice and understand what they are learning in the classroom, and maybe to cover certain aspects more in depth. If your child is having problems doing their homework correctly or understanding and completing it the right way, they need help. Tutoring is the best option for most kids specially when it comes to homework help. Many times kids will need professional help in order to learn the right methods and skills to successfully complete their homework without the need for permanent assistance. Tutoring will greatly benefit a child that needs more explanations in their homework or that needs help building homework skills. Get your child the right tutoring help for all homework and learning needs. At The Tutoring Center in Garland TX we will work with your child to provide him with all the tools needed to be successful in their homework, their school work and throughout their learning. We are the most qualified professionals and the best option for tutoring in Garland TX. Call us today at (972) 200-7877.